View all articles of Delphi 1/2019 for free. The review is read by big picture thinkers, who want to know how emerging technologies shape our present and future. Delphi addresses everyone with a background in one of the focus disciplines –science & technology, ethics, economics, business and law – as well as curious individuals. The issues tackled by Delphi are highly significant for professionals engaged in strategic, forward-looking and visionary functions. Readers in other positions, working more narrowly in one of the focus disciplines, will also benefit from the review’s content. Geographically, the quarterly mainly targets Europe, North America, Asia and Africa, although other regions shall not be excluded. Is Mark Zuckerberg listening in on your dinner conversation through your smartphone? Has China already created the first designer baby? How many accidents did the self-driving Tesla cause so far? 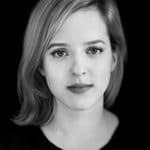 With the increasing frequency of data breaches, the ever-growing impact of algorithms on individuals and society as well as the revolutionary advances in the field of gene-editing, what’s evident is that closer examination of emerging tech ethics – involving both thinkers and doers – is essential. Hosted by the Delphi Journal with the Impact Hub Berlin, our event 'Ethics in Emerging Tech' will zoom in on this controversial area, provide insight from tech professionals, start-ups, business, lawyers and academics and offer a platform to exchange ideas, concerns and solutions. 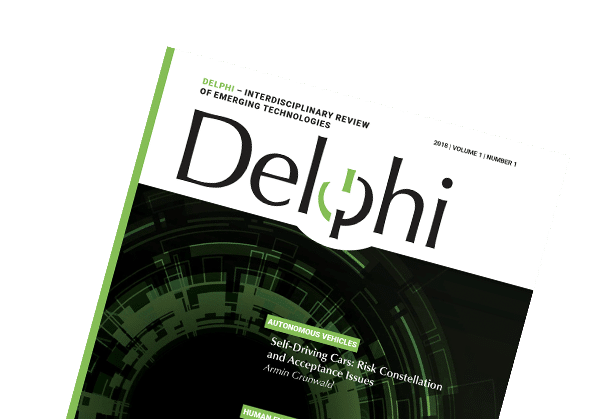 Featuring contributions on self–driving cars, smart drugs, artificial intelligence and copyright and blockchain, Issue 1 of Delphi will be of interest to anyone with how emerging technology is impacting society. View all articles of Delphi 1/2018. Yes, I would like to order the first issue of Delphi (1/2018) for free. I also want to subscribe the Lexxion Newsletter about »Emerging Technologies« in English language next. Please have a look at our Call for Papers for further information on submission deadlines. Spontaneous contributions are welcome and should be sent to Executive Editor Clara Hausin at hausin@lexxion.eu. Only submissions of excellent quality will be accepted in Delphi. Responsibility of the factual accuracy of a paper rests entirely with the author. All publications must clearly distinguish themselves from the status quo of discussions and provide an added value to them. Generally, contributions should not have been published before, nor be pending elsewhere, however, with respect to academic articles, we accept already published papers in case the content has been adapted to the requirements of Delphi in both format and style. After the manuscript is submitted, it will undergo a quality check for accuracy and relevance. Submission of a manuscript does not imply claim for publication. Optionally, before submitting a manuscript, the editors may be contacted regarding the suitability of a given topic for Delphi. Delphi is an interdisciplinary review read by professionals from different fields and sectors, therefore contributions must be written in an accessible and inclusive language. References and technical terms only understood by and known to professionals from particular areas of expertise need to be clarified either in the contribution itself or in the footnotes. Delphi features variable sections that aim to provide both in-depth information on current developments in emerging technologies and hands-on knowledge for the reader’s daily tech practice. The sections and contribution formats will be adapted over time to the needs created by upcoming debates. In the Articles section, professionals with a background in one of our key disciplines science & tech, ethics, economics, business and law share their view and analysis of important developments in emerging technologies. Contributions to this section must rely on pre-existing literature and facts. We encourage the submission of relevant contributions from authors with backgrounds in other disciplines as well. The Roundtable section encourages unsettling, provocative debates on a given topic between authors with opposing views and different backgrounds. Contributions can but do not need to be) essayistic and must always express the author’s personal view. The Startups Digest section sheds light on startups and grassroots initiatives from around the world that push the boundaries of emerging technologies. Contributions should be submitted to the associate editor(s) curating this section. Ethics in Practice is striving to encourage the creation of responsible guidelines on how to implement ethics in technology, particularly in the business, regulatory and scientific fields. Contributions can come in the form of thought-provoking essays and reflections on ethical standards or, for instance, present your business’s approach on making your products more ethical. This section, too, is open to contributions from everyone with a background in one of our focus disciplines or in other relevant fields. The Panorama section reports on developments in emerging technologies in various countries worldwide. Contributions can focus on particular countries or regions or use a comparative approach. We welcome submissions from professionals with a background in one Delphi’s focus disciplines. Contributions to the Books & Arts section introduce the reader to new publications, films or video games and give a critical appraisal of the strengths and weaknesses of their treatment of emerging technologies. We highly encourage the author to embed the object of the review into its larger context by referring to related key issues and debates. We accept contributions from both professionals and curious individuals if they meet the requirements stated in the author guidelines. In the Events section, important events on emerging technologies and the focus disciplines from around the world shall be reviewed. The authors are welcome to critically discuss the entire event, however, reviews of particular speeches and presentations can also be submitted. We accept contributions from professionals as well as curious individuals if they meet the requirements stated in the author guidelines. Subtitles are allowed and should also not exceed the three lines rule (max. 200 characters including spaces). To do so: In the References ribbon tab, click the Footnotes launcher (lower right corner in the Footnotes section). There, place an asterisk into the custom mark: box, then click insert, and type your footnote text. All further footnotes should be numbered sequentially in superscript in the text outside punctuation marks. Tables and figures should be submitted on extra pages. Every table should have a title. The relevant sources of the data presented or of the tables or figures themselves should be indicated. Within the text, the position at which a table is to be included should be marked by ‘[TABLE …]’, the tables and figures being clearly numbered. Every table should be referred to. To ease the typesetting process, please keep formatting within tables to a minimum (e.g. 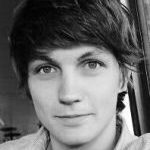 avoid merged cells or the use of vertical text for headings). All references should be included in the footnotes. No final bibliographies are allowed. The reference style is OSCOLA. All contributions should be submitted in British English.